Daylight hasn’t much further to fall to find total darkness, as we eventually enter the main door into a benchmark public house; a blueprint that has been hanging on this corner in Sedgley since 1860, for the nation’s publicans to come and observe. Its recipe remains as original as its beer, brewed out back, with its Victorian vice keeping it well and truly planted in the 19th century. The opening hours aren’t immune. Nor is the style of service. A sprinkling of modern signage and security measures are there for your eyes to see – bedfellowing with Victorian bell-pushes and genuinely old portraits – yet little other than a soothing mood consumes your senses... as you enter off the modern mundane public pavement of Bilston Street, out front, into the date-stamped passageway, floor-tiled in red. Many pubs take a while to warm up, getting into the groove of business over a couple of hours in some cases: it happens here in a matter of minutes, like ale-hungry moths lured by gas lamp fixtures and back-lit beer engines. Labourers – laden, still, with that day’s duty of plaster, paint, dust and grime – take early-shift solace in the six-tile-wide passageway of this pub, each with a handled dimple glass, headed mostly with the stuff of Sarah Hughes Brewery, quite possibly 6% Dark Ruby Mild, quite possibly more being brewed right this moment, just a few footsteps away. It’s a swathe of dimpled pint glasses as far as the eye can see, as we too take refuge in the narrow hallway, flanked by one of the serveries and the sweeping staircase. With an increase in custom making its way through the front door we are forced up one of the rungs to allow the latest troops hatch access. It’s definitely a hatch too – rare and remarkable in its design – with three serving windows in total, each serving a different part of this elegantly basic public house. They are best described as squat wooden sash windows, with mottled glass inserts. Inlaid in a dark red wood surround, they ooze even more romance for their positioning, allowing both customer and bar staff very little in the way of eye contact, perhaps a midriff at best, and just enough sight of one of the seven hand pumps being pulled for your beer. Stooping down to pay for and collect your pint off the narrow hardwood 1920s island counter is treated as much a charm, as many would assume an inconvenience. Captivated – it is hard not to be, by this intentionally compromised central tree house of beer: each one of its many panes of glass a corner shop sweet jar. The rich goods, and their actions behind, attract the attention of both regulars and visitors (with blurred curiosity) as a refraction of reds, greens, blues and yellows moves around the room – darting from behind bar staff as they rotate from hatch to hatch – changing the form and composition like an internal lighthouse. It’s a solid survivor that proves that you can do just swell (immeasurably so, with the queues forming at each hatch) with a simple blend of honest home-brew, cheese and onion baps, and staff that clearly like being there. Certain customers take up a seat in one room, whilst others prefer another, dividing up a beautiful mix of backgrounds, voices, and opinions – these acoustics seemingly collecting in the passageway as a casual crescendo – like the perfect jukebox song played at the perfect moment on a perfect date. It’s a soothing hum that speaks of community, of thriving warmth, and of good business practice – without being able to decipher one word from another. Forget scented lavender candles, essential oils, chamomile bubble bath and orca whale CDs; this soundtrack could settle any teething child into lull, a grown man down from a day’s rage… relax the wildest of woman’s woes. 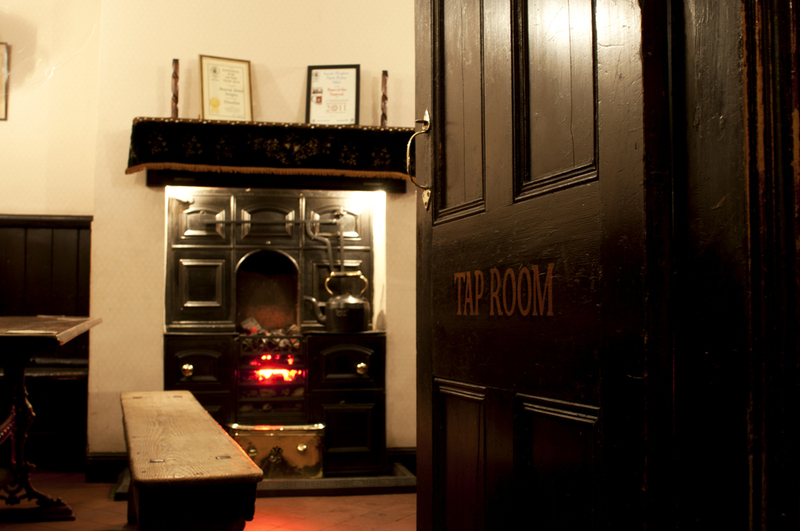 But of course there’s nothing quite like the real thing – awaiting your ears and more, everyday here, in Sedgley: a real pub with real award-winning ale, real outdoor lavs, a real Victorian brewery tower… and very real Victorian opening hours. Jon Saxon is the founder and editor of Doghouse Magazine and Ludlow Ledger.